To promote its new ‘Hidden Valley For Everything’ dressing, Clorox partnered with BuzzFeed to expand on its nickname “The New Ketchup,” in a fun, engaging way. This case study looks at how the FMCG firm enjoyed a 400% brand lift in social sharing via native content marketing. 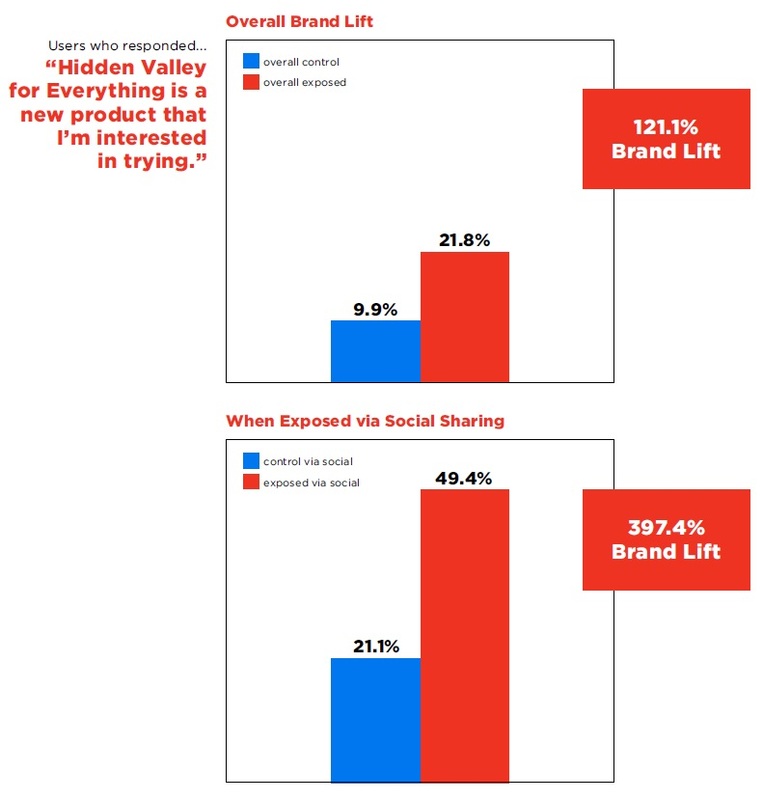 •	400% brand lift and social sharing lead to 99.8% ‘more likely to respond positively’ to the brand. In 2012, Clorox’s Hidden Valley Ranch introduced a thicker, creamier version of its signature dressing designed for dipping and topping, called Hidden Valley For Everything. But how could the How can Clorox’s Hidden Valley For Everything prove it’s the world’s best condiment? Working with agency Tribal DDB, the brand prompted the debate through a series of posts, we were able to engage readers in a topic many feel truly passionate about: What goes on the food they eat. Through a series of custom social posts like “10 Foods Made Better With Ranch Dressing” and “Why Ranch Is The Best Condiment,” Hidden Valley For Everything and BuzzFeed inspired consumers to join in on the “Ranch vs. Ketchup” debate. 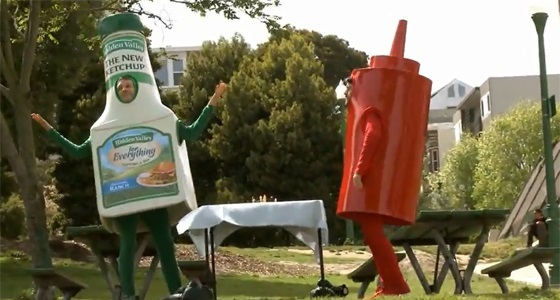 Taking it a step further, BuzzFeed branded two reactions as dueling badges depicting the “clash of the condiments.” The badges brought the battle to life, increased brand exposure across the site, and allowed consumers to interact with Hidden Valley in a fun and unexpected way. BuzzFeed’s audience of 30+ million SuperSharers proved that custom content like this is what they were hungry for as they viewed, commented on, and shared the sponsored posts across the web. In addition to sponsored stories, BuzzFeed branded two reactions that allowed users to interact with Hidden Valley for Everything in an unexpected and inherently social manner. With BuzzFeed’s in-house integrated offering, custom posts and multiplepieces of content were developed, produced, and implemented to deliver on brand objectives. The effort was intended to appeal to millennials who probably aren’t all that attuned to Hidden Valley’s more family-oriented ads for original Hidden Valley Ranch salad dressing. Hidden Valley for Everything and BuzzFeed conducted a Nielsen Online Brand Effect study to evaluate the impact of this content strategy on users’ perceptions. The study measured brand affinity based on whether a viewer had no exposure to the content, viewed the content as a result of paid media, or received the content through social sharing (i.e. a friend’s Tweet or Facebook post). When Exposed via Social Sharing Visitors overwhelmingly embraced Hidden Valley for Everything’s content on BuzzFeed especially when received through sharing activity, leading to increased brand affinity and purchase intent. Overall, those who discovered the BuzzFeed Hidden Valley for Everything content through social sharing were 99.8% more likely to respond positively to the brand. 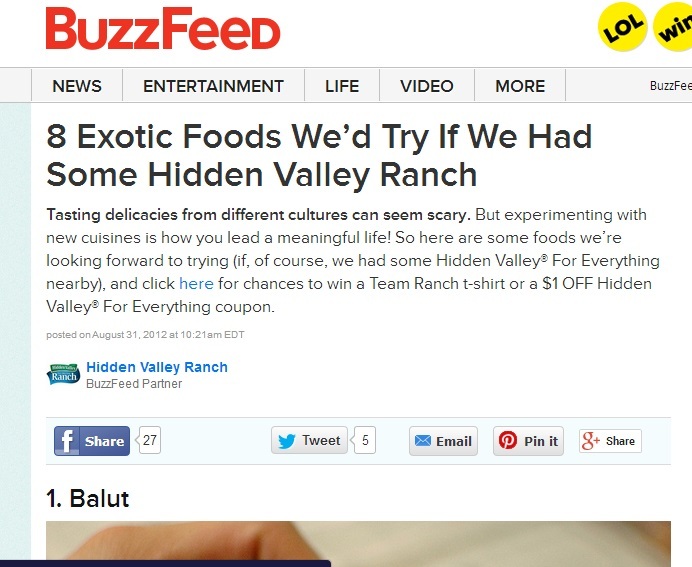 Hidden Valley for Everything’s BuzzFeed content struck a chord with consumers as it spread across the social web, leading to dramatic increases in both brand affinity and purchase intent. Through custom content and reactions, Hidden Valley and BuzzFeed exceeded brand objectives and started a social conversation.